Is today really the seventeenth?! As I predicted, October is just flying by! I'm starting to feel a little bit nervous about the Halloween costumes, which I haven't worked on all week. But of course, I do have time. I'm going to try to finish Elisabeth's today if I can. 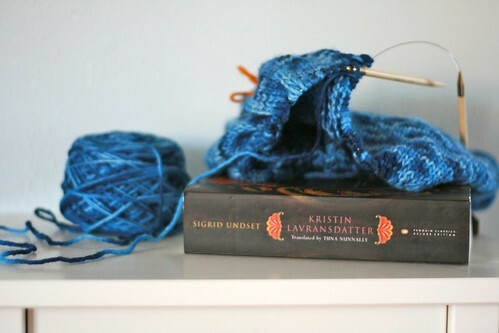 I'm joining Ginny in the Yarn Along again today. Still knitting James's sweater, which is going kind of slowly. One would think on size 10 needles that it would just fly off the needles, especially with how many sports practices and games and meets and lessons that I sit through on a weekly basis. But for some reason, it's just going slowly. Oh, well. One thing I love about knitting is that it can only be done a stitch at a time. It forces a little bit of consciousness of process and time and patience. I'm also still reading Kristin Lavransdatter. Actually, the copy I was reading before belonged to a friend in my book group, and I gave it back to her, and then it took me a week or ten days to pick up my own copy, so I've only just started the second "book" (middle section of the complete work) recently. I love the book although I've been too tired to read very much in the evenings.